I very much dislike the tendency for snappy manga heroines, the observant ones with a bit more bite to them than the usual good girl, to lose their spark as soon as love enters the picture. It’s too old-school “taming of the shrew” for me, playing into the idea that a smart girl who refuses to hold her tongue just needs romance to calm down and be properly feminine. Which is why I find the way this series has turned the heroine Yukina into a confused observer, instead of a determined director of the action, disappointing, as seen in this latest volume. He thinks he loves her because he misses spending time with her now that she’s got a boyfriend. She’s always cared for and protected him, and this reader, at least, suspects that his “love” is really fear of having to stand along for himself. Anyway, once Akira declares his feelings, the first guy, Shigure, gets jealous and decides he’s not leaving Yukina after all. Shigure takes her on a date to an outlet mall (? ), where we see a brief glimpse of the sass she used to have, as she ditches him in favor of observing other couples. He’s pulling out all his (formulaic) tricks, but instead of a gooey couples’ gift, she asks for an ice cream cone. It was just enough of what I liked about her to make the other scenes where she gets confused by her feelings less tolerable. 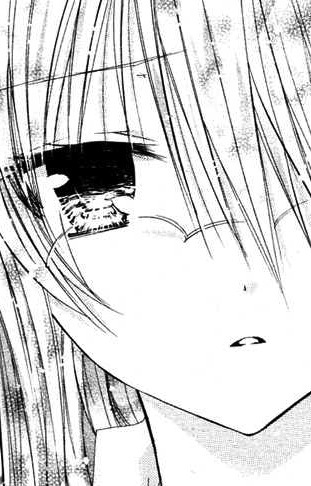 I’m finding it distracting that Yukina’s glasses have become the merest suggestion of connected ovals, replacing her nose, as shown here. The shapes keep reminding me of mouse ears, making it seem that this manga has been heavily sponsored by Disney. More seriously, it’s unfair to writers, I think, to suggest that you get a successful creation by thinly fictionalizing whatever happens to you. Yukina’s latest cell-phone novel is popular because she’s using it to work out her own thoughts about being part of a love triangle. That’s great, that it works for her both as praise and psychotherapy, but we never see her actually working at her craft. I know, this story by Ema Toyama is fiction, but it’s a disservice to artists to play into such common misconceptions of how creativity works. You don’t have to live an artistic life to be a good writer. Some actually use their imagination.